PNY uses the cheapest version of the NVIDIA GeForce GT640 graphics to mount a set price and acceptable performance, aimed at users looking for a dedicated fluency when working with content in high definition with something to offer in the field Playable. 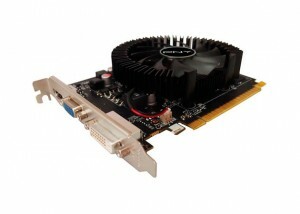 Today we brought you the review of PNY GeForce GT640. NVIDIA launched three versions of GeForce GT640, two based on the core GK107 (also known as Kepler) and one based on the GF116 (Fermi). The new PNY GeForce GT640 graphics card is truly compact, making it a good choice for HTPC computers where is no spare space available. The graphics PNY GeForce chip (96 cores, 780 MHz) is accompanied by 2 GB of GDDR3 memory running at 1070 MHz (for 891 in the reference model). Give outputs DVI, VGA and HDMI. The new PNY GeForce GT640 is perfect for a CPU to playback HD content, its power can free the processor from heavy tasks and NVIDIA proprietary technologies help a smooth playback without any breaks and artifacts in image. With a consumption of only 64W, is fed directly from the slot and can work seamlessly with sources that reach about 300 watts. PNY GeForce GT640 card has proven solvency when moving with all kinds of content (including high bitrates), keeping temperatures below 40 degrees at all times. The design of the blades of the fan allows quiet and efficient cooling. Taking it to the limit with Unigine Heaven 2.5 does go 60 degrees and the fan work begins to show, but passed the test with remarkable 23 FPS and 567 points. The users interested in video games should not be deceit. We are facing a card capable of running almost any current game, but do not offer enough power to move them in high definition and high quality standards. So, you think of running MMOs, strategy or sports titles will be sufficient to 720p, but it is fair to say that it is not a good choice for higher purposes. It has in its catalog PNY options chips oriented gaming. The PNY GeForce GT640 is a card designed for a specific purpose and meets and exceeds the usage scenario to which it is addressed. The prospective buyer should forget about acronyms and marketing tricks to avoid surprises, but there is no doubt that this is a quality product, well built and getting the balance between performance and consumption. Its small size, low power and video output options PNY GeForce GT640 orient toward HTPC chassis or compact equipment, aimed at multimedia playback, productivity and web browsing. And yes, you can run game with some ease, but not its purpose or rationale should be to evaluate your purchase.